Life has returned to something vaguely resembling normal (almost), thank God, because it’s Monday, and I have to work again this week and that always throws my organisational syatems up in the air. But my house looks (mostly) LOVELY, and it’s warm, even in this near-winter, and, yes, quiet too. I love it. I’m incredibly grateful, and yes, all the enormous stress was worth it. Not only that, my house is CLEAN. And, with a few exceptions (there are still two piles of stuff left to sort out – we used this as an opportunity to do a major purge, and part of that was getting rid of some old and useless furniture that just happened to be sitting around gathering dust, and not necessarily putting back every single thing we owned, but going through it slowly and deciding whether or not it was actually still wanted), organised. Now “clean” and “organised” have been my unattainable goals for a long time now; things I strive for desperately, desperate to have one of those beautiful house-and-garden houses that my friends seem to have. And now I’m doing it! I’m living the DREAM! And there’s not even an Ikea in sight. I know. Crazy, right? Carpet in my son’s room. Isn’t it lovely! 2. Go to America. You heard me. Although, granted, if you actually LIVE in America, you probably need to go somewhere else. But travel. Go stay with a friend you haven’t seen in years. Although…here’s the trick…make sure they’re great housekeepers. I’m serious! See, you can have friends (as I do) who are great housekeepers when you’re at home, but when you visit them you see them sitting drinking coffee at the kitchen table, or relaxing on their couch. When you actually go stay with people you get to see how they do life on a larger scale. And what I learned was this: they clean their houses every morning. Seriously! I KNOW! But you know what? It works! Because the house is already clean, it only takes a few minutes to run through and do it, and then it’s not dirty for the next day when they clean it. Cool, eh? I’ve been trying this. Sometimes I’ve even been succeeding. 3. Kill off your parents. Oh OKAY, I’m not really serious. Winning the lotto will also do it. And NO, before you start wondering, I DID NOT kill my dad. He just up and died, all by himself, heartless thing. BUT, he did leave me all his money (I’m an only child. If you’re not, and you take the title of step number 3 literally you may also need to bump off your siblings. Although if you took me literally you’ve probably not got any kind of sense of humour and it’s not a how-to-clean-your-house blog you need, it’s serious therapy). But Dad died, we inherited more money than we needed to just pay the electricity bill and buy our kids a Happy Meal to celebrate, so we bought carpet. See? Onya Dad. We’d probably still be dreaming about it if it wasn’t for you. 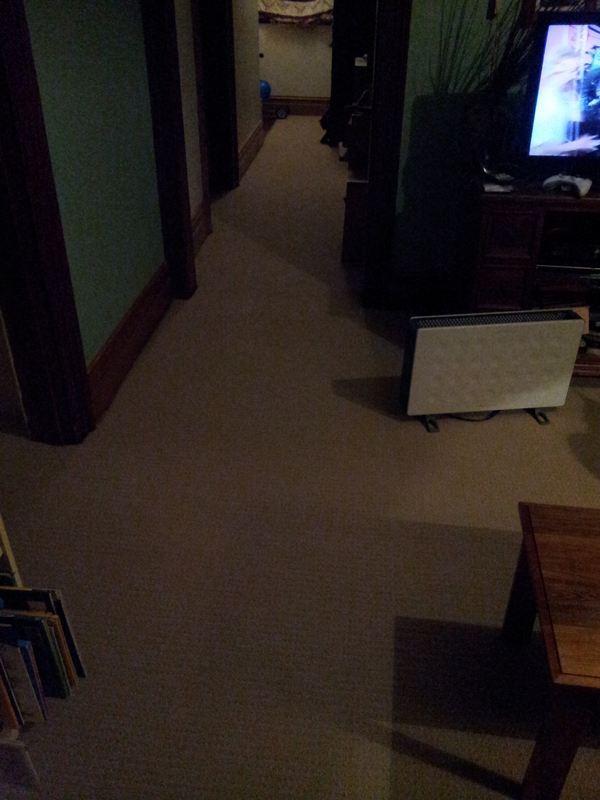 Lounge room carpet, but the lighting isn’t that great. Just ignore the walls. 5. Get rid of everything in your house. Yes, and I mean EVERYTHING. 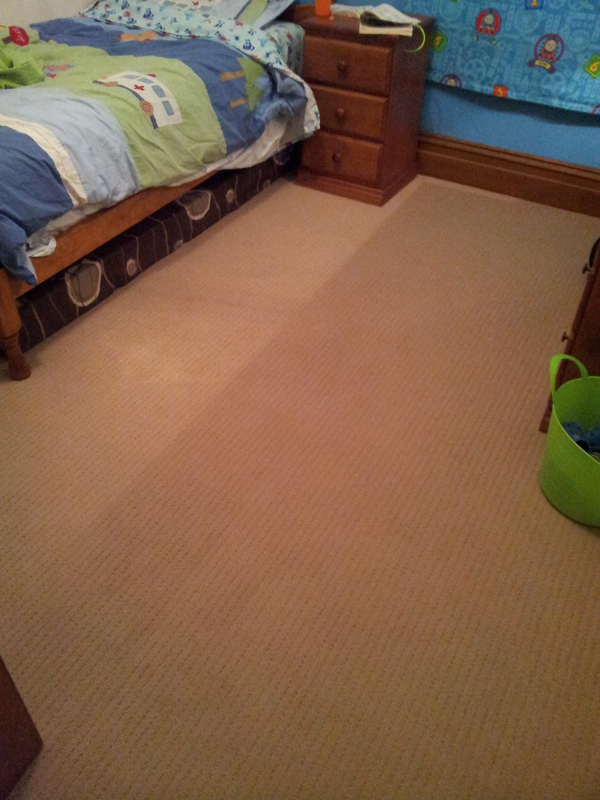 Putting down carpet is like moving…like moving house and staying in the same spot. It’s win, kinda. My friend Annie who has moved a LOT of times has the most organised house, and she tells me it’s because every time you move house you chuck out the random stuff you accumulate and don’t think about. Moving house makes you ruthless. It made me think “I wish we could move”, even though I like our house, I like where we live, and didn’t want to. But tada! Carpet is moving-wish granted. And you can’t fudge it with carpet like you do with general cleaning…you know, just kind of pack up around the stuff you’d rather not deal with. You just can’t carpet over old furniture or kids’ puzzles with pieces missing. You either have to chuck them out or store them. And when you’re storing them you think “WHY am I storing this?” and then you chuck it. Or you leave it on the floor to be carpeted over so the new owners can discover it in twenty years’ time…but that’s just weird. 6. Bring back inside only the stuff you need or desperately want to keep. Yes! Leave out all the kids’ kindergarten craft (unless they’re still in kindergarten and they love them). Leave out the ugly bookshelf with the books the kids no longer read. Leave out the mangy wardrobe with the stuff piled on top. Leave out the stuff. Even better, make sure (as we did) that you store everything in SOMEBODY ELSE’S SPACE so you can’t simply leave it in the garage for the next twenty years. Hire a shipping container. Borrow your neighbour’s garage. Just. Don’t. Forget. To. Sort. It. 7. Turn around. Look how nice your house is without all that extra stuff! Roll on the new carpet. Offer up a silent prayer of thanks. Think about your dead parent, and how much they would have loved to see it. Yell at the kids to get their food off the precious new flooring. Roll around some more. Do a cartwheel. Don’t tell anyone, because you’re nearly 40 and you’re really bad at doing cartwheels. 8. Go to America. Okay, that bit doesn’t have much at all to do with keeping your house clean, but gosh it’s a cool place. And you get to hug your friends who taught you how to clean up every morning, but it sure is fun. And, face it, America is awesome. Almost as awesome as carpet. 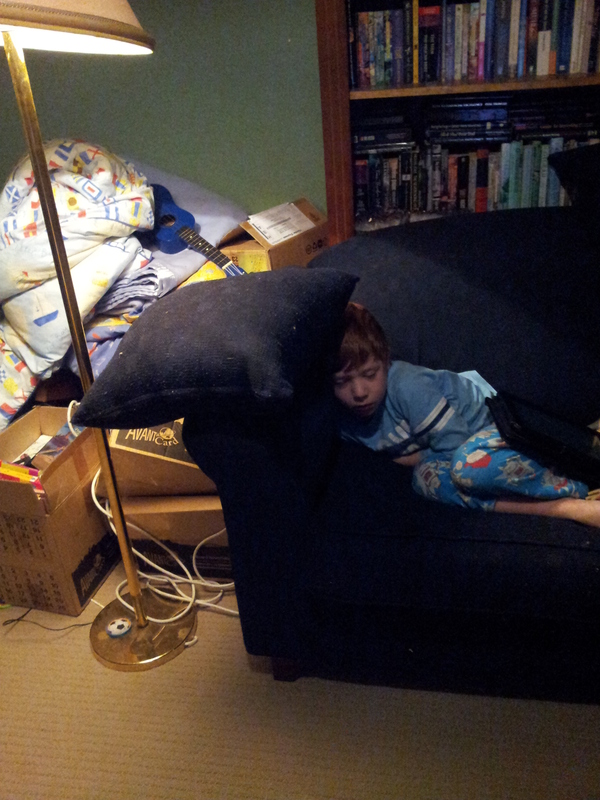 My 7yo watching TV in our lounge room. See? This is the pile of stuff we still need to sort out. It happens. We’ll get there. How about you? Any awesome tips on how to keep a house organized…especially after the novelty of new carpet wears off? I know. It’ll happen eventually. Give me your best tips now, so I can stay organised when it does!